About "Applying multiplication and division of rational numbers"
To solve many problems in math, often we may have to use multiplication and division of rational numbers. In this section, we are going to learn how to multiply and divide rational numbers. Rational numbers are usually denoted in the form "a/b". 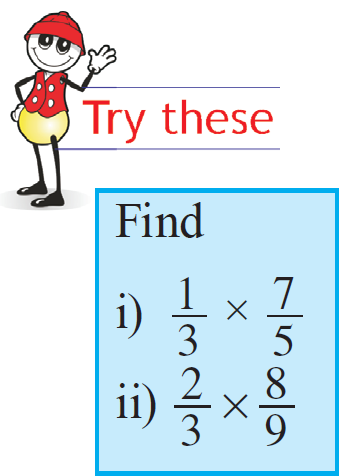 To multiply a proper or improper fraction by another proper or improper fraction, we have to multiply the numerators and denominators. To multiply a proper or improper fraction by a whole number, we have to multiply the numerator of the fraction by the whole number. Lily reads 1/4 th of a book in 1 hour. How much of the book will she read in 3 1/2 hours ? Hence, Lily reads 7/8 part of the book in 3 1/2 hours. David ate 1/3 of the pizza and gave 3/4 th of the remaining to his friend. What is the part of the pizza did David give his friend ? Hence, he gave 1/2 of the pizza to his friend. After having gone through the stuff given above, we hope that the students would have understood "Applying multiplication and division of rational numbers". Apart from "Applying multiplication and division of rational numbers", if you need any other stuff in math, please use our google custom search here.